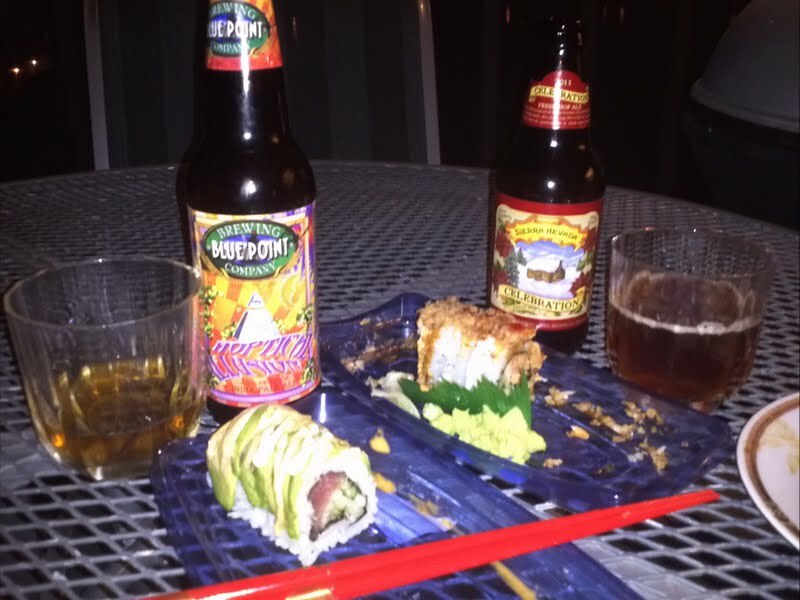 Sushi and Craft Beer – A Great Combination! There is so much potential to match and mingle craft beer with food to please and surprise the palate, and the other evening having done just that, I wanted to share the results with you! At first thought, it seemed like an unlikely pairing, but the more robust winter taste of the Celebration Ale aptly complimented the spiciness of the Crunchy roll with the chili sauce. The mahogany woody essence of the Celebration Ale added a hearty richness to the shrimp and zesty chili flavors. The more muted and less flavorful (but still delicious!) tuna and avocado flavors lent themselves well to the hoppy Hoptical Illusion, which was a nice surprise. (The Celebration Ale overpowered the Dragon Roll to the extent that the sushi ended up tasting bland…) Whatever was the sauce on the top of the Dragon Roll mixed and swirled well over the tongue with the Hoptical Illusion providing a light and flavorful burst for the unexpecting palate. A good combination indeed! Please let me know what Sushi and Craft Beer pairings you’ve tried and want to try again and again? I’ll feature them in this blog and credit you! Happy and safe imbibing my friends!